Before the first game, cards should be unpacked and sorted according to their type - separate Common cards and cards of each Faction into individual stacks. After the game we recommend to keep each type of cards separately to speed-up the setup for future games. The following rules refer to a game for 2-4 players. 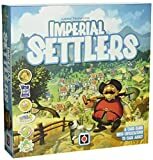 Rules for the single player game can be found on here. Place the score board on the table where it can be easily seen by all players. Place the round marker on the "I" space of the round track. Shuffle the Common cards and place them face down in easy reach of all the players. Players place their Faction boards in front of them, shuffle their Faction cards and place them nearby in a face down deck. If there are fewer than 4 players, return the remaining pieces to the box. Each player places his Faction marker on the "0" space of the Victory Point track. Place all Resource and Worker markers and additional tokens in easy reach, creating the general supply. Note: You will only need 1 Defense token per player. More Defense token are included for use with the future expansions. Randomly select the First player. The selected player takes the First player marker. At the beginning of the game, each player, beginning with the First player, draws 2 cards from the Common deck and 2 cards from his own Faction deck. These four cards are the players' starting hands. Now you're ready to begin the game. 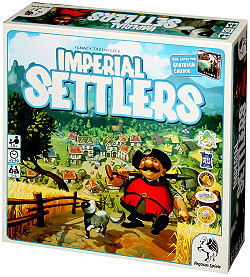 The goal of the game is to have the most Victory Points, earned by expanding your empire and hindering your opponents. During the game, players can gain Victory Points (VP) in various ways: from deals they make, from actions they take, and from Location features. 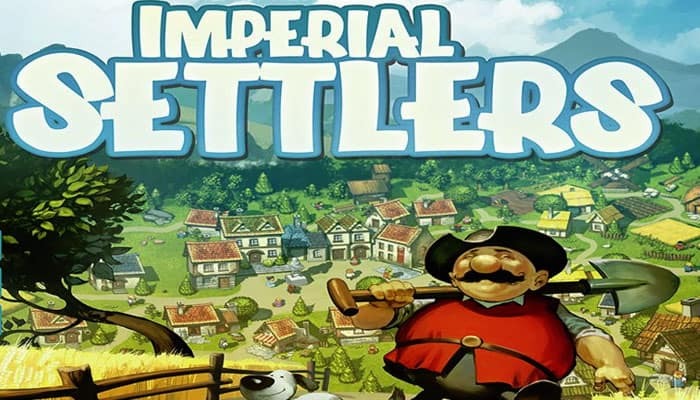 The Locations that become part of a player's Empire are also worth Victory Points. At the end of the game, players add the VP value of their Locations to their current VP score to reach their total score. The player with the most VP has built the greatest empire and wins the game. Players receive Resources, Workers, Raze tokens, etc. produced by their faction. The main phase of the round. 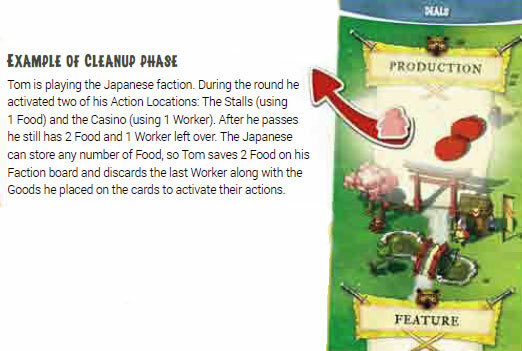 Players use their cards, Resources, Workers, etc. to take actions to expand their Empire and score Victory Points. Players discard all used and unused Resources, Workers, Gold and tokens. In each round, the phases are executed in the same order. The exact description of each phase is presented in the next chapter. Each player draws the top card from his own Faction deck and adds it to his hand. Draw from the Common deck the number of cards equal to the number of players, plus 1 (i.e. 4 cards in a 3-players game) and place them face-up in the center of the playing area. Players are now ready to select cards. Starting with the first player and proceeding clockwise, each player will select 1 card from the revealed set of cards. The remaining card is discarded without further effect. Again, draw from the Common deck the number of cards equal to the number of players, plus 1 and place them face-up in the center of the playing area. In the second round of drafting cards, the last player starts, and this time counter-clockwise each player will select 1 card from the revealed set of cards. Once again, the remaining card is discarded without further effect. There's no limit to the number of cards a player may have in his hand. Cards in hand are kept secret from other players. 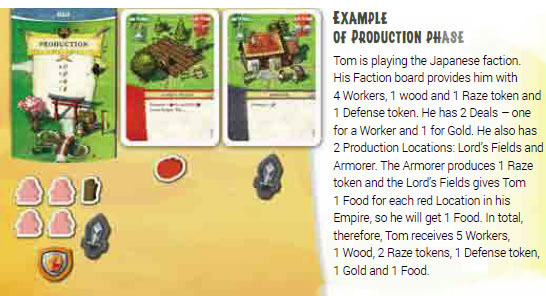 Faction board - this is the Faction's basic Production providing the player with a specified number of Workers, specific Resources and tokens. Deals - each signed Deal provides the player with 1 specific Good. Production Locations - each Production Location has its own ability and produces a specified kind and number of Goods. Cards should be drawn from either the Common deck or the player's own Faction deck (player's choice), unless stated otherwise. VPs are marked by adjusting the Faction marker on the Victory Point track. All other Goods are taken by players from the general supply and placed in their own supply. 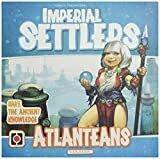 Note 1: In the first round players only collect Goods provided by their Faction board as they neither have Deals nor Production Locations in their Empires yet. Note 2: Resources, Workers and tokens which players obtain in the Production phase can only be spent in the current round. All unused Goods (apart from Victory Points and cards) are discarded at the end of the round. This is the main phase of the game in which players take their actions to build and/or raze Locations, make Deals, use Action Locations and exchange Workers for Resources. Starting with the First player and continuing clockwise, each player performs one action at a time. The Player can take any available action or pass. All the actions are described in detail in a separate chapter. Once a player passes in the Action phase, he cannot perform any additional Actions in the current round. Neither can he be targeted by the Actions of other players. For example, a player who has passed cannot have any of his Locations Razed. There is no limit to the number, type or order of Actions a player may take during the Action phase, so long as he takes them one action at a time. The Action phase continues until all players have passed. During the Production phase each Faction gains 1 Defense token. During an Action phase, at any moment in his turn, a player may place the Defense token on one of the Common Locations in his Empire to protect it. The Defense token protects aparticular card on which it is placed - it increases by 1 the number of Raze tokens required for an enemy to raze that Location. Once placed, the Defense token cannot be moved to any other Location. When the Location is razed the Defense token returns to the general supply. Defense tokens (unused and from Location cards) are discarded with all other tokens and markers at the end of the round in the Cleanup phase. Note: Skip the Cleanup phase in the final round. Goods are used as the deciding factor in the event of a tie. Players can use storage abilities (cards providing storage abilities, Faction board storage) to save any of the indicated type of Good(s). 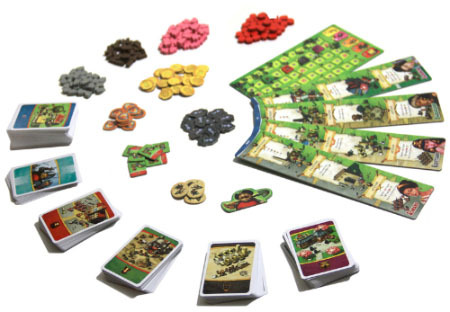 Players discard all non-stored Resources, Workers, and tokens (Defense tokens, Goods that were used to activate Action Locations, and all other remaining Goods). Note: Cards in hand are never discarded at the end of the round. Pass the First player token to the next player in clockwise order. Move the round marker to the next space on the Round track. The game lasts for 5 rounds. After the fifth round each player calculates his final score. Note: Some Japanese Feature Locations (Shrine, Gate) reward the player with extra VPs at the end of the game. The player with the most VPs is the winner. In case of a tie, the tied player with the most Workers and Resources left is the winner. If the players are still tied, the winner is the tied player with the most cards left in his hand. If there is still a tie, the tied players share the victory.